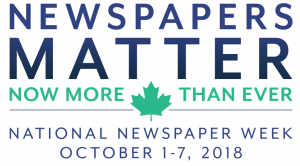 How did you YOU celebrate National Newspaper Week? We want to know! Send us your photos, video, and editorial coverage of your events and other ways you celebrated National Newspaper Week. Please provide your first and last name, as well as your role at the newspaper. Provide a brief description of your submission. Upload tearsheets, photos, or video here. Maximum of 5 files. Maximum file size 20 MB. Accepted file types: doc, docx, jpeg, jpg, gif, png, pdf, mov, mp4.